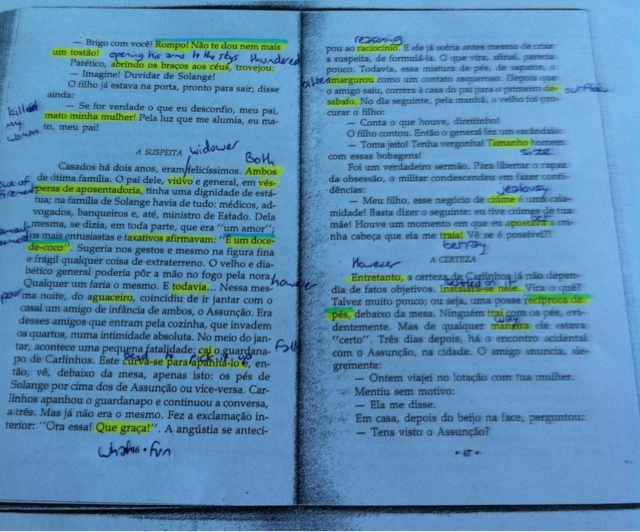 This is a picture of my Portuguese homework, which I’m showing to you as a cautionary tale. 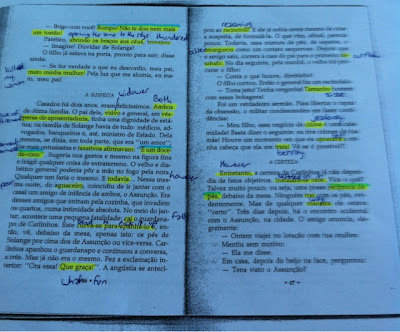 If you give a text to your students and it has as much highlighted text in it as mine does, the chances are that they are not really reading the story. They are more likely to have their heads in the dictionary than they will be getting involved in the narrative, questioning the characters motivation or attempting to understand the author’s point of view, all things that fiction is supposed to provoke. When reading becomes solely about vocabulary acquisition, so many opportunities for debate, discussion, engagement and real intellectual stimulation are missed. So do your students a favour and give them texts they will actually enjoy reading. Trust me, I’m telling you this from a student’s point of view. This certainly is another point in favour of Jez Uden's idea of input -1 for more extensive reading (http://www.teachingenglish.org.uk/seminars/bc-seminars-jez-uden). Thanks for sharing, James. How many pages was the homework in total? I completely agree with you, James, especially because much of what you have highlighted in this text really affects the understanding of it. What's the point? Better to give you a word list, if vocabulary acquisition was the goal – which I'm guessing it wasn't. I really enjoyed reading a teacher speaking from a student's perspective. Studying languages sure makes us see some things differently, doesn't it? Hi Gordon, thanks for the comment. The story was 6 pages in total, but I only read the first three before I lost patience and ran out of time. I'm definitely in agreement with the input -1 idea, even if it's difficult to achieve in reality as most students want to read input +3 in my experience. As for me, if I want to actually read and enjoy the story, it's got to be -1. Hi Ceci, thanks for your feedback. As you guessed from my highlighted vocabulary, I really didn't have much idea of what was going on and I might as well have had a word list, which of course would have been incredibly dull. I can't tell you how helpful I find it as a teacher to study another language, it's so informative. I'll have to do a few more posts like this! I agree completely. Memories of French homework are the same, struggling to understand, rather than enjoying the text. Previous Previous post: Blogoversary & Blog Challenge: What’s Your Story?